References m_areaCurrentSym, m_ix, m_iy, m_unixarea, and m_unixGraphics. References DELETEP, m_unixarea, and m_unixGraphics. References m_areaCurrentSym, m_fontcombo, m_SymbolMap, m_vadjust, m_windowMain, s_CurrentSymbol_clicked(), s_delete_clicked(), s_destroy_clicked(), s_dlg_response(), s_keypressed(), s_new_font(), s_new_row(), s_scroll_event(), s_size_request(), s_sym_SymbolMap_draw(), s_Symbolarea_draw(), and s_SymbolMap_clicked(). References _connectSignals(), _createComboboxWithFonts(), _previewNew(), abiAddButton(), abiDialogNew(), BUTTON_CLOSE, BUTTON_INSERT, XAP_Dialog_Insert_Symbol::ConstructWindowName(), XAP_App::getStringSet(), XAP_StringSet::getValueUTF8(), m_areaCurrentSym, m_fontcombo, XAP_Dialog::m_pApp, m_SymbolMap, m_vadjust, m_windowMain, XAP_Dialog_Insert_Symbol::m_WindowName, and s.
References GR_CairoGraphics::getAllFontNames(), XAP_Dialog::getApp(), and XAP_App::getGraphicsFactory(). References XAP_Dialog_Insert_Symbol::_getCurrentSymbolMap(), XAP_Draw_Symbol::getSymbolRows(), m_vadjust, rows, and UT_return_if_fail. Referenced by New_Font(), and runModeless(). References XAP_Dialog_Insert_Symbol::ConstructWindowName(), m_windowMain, XAP_Dialog_Insert_Symbol::m_WindowName, and UT_return_if_fail. References m_InsertS_Font_list, m_windowMain, XAP_Dialog_Modeless::modeless_cleanup(), and UT_DEBUGMSG. References XAP_Dialog_Insert_Symbol::_onInsertButton(), m_CurrentSymbol, and XAP_Dialog_Insert_Symbol::m_Inserted_Symbol. Referenced by CurrentSymbol_clicked(), Key_Pressed(), s_dlg_response(), and SymbolMap_clicked(). References XAP_Dialog_Insert_Symbol::_getCurrentSymbolMap(), XAP_Draw_Symbol::getSelectedFont(), XAP_Dialog_Insert_Symbol::m_answer, m_InsertS_Font_list, m_windowMain, XAP_Dialog_Modeless::modeless_cleanup(), and s_Prev_Font. References XAP_Dialog_Insert_Symbol::_getCurrentSymbolMap(), XAP_Draw_Symbol::calcSymbolFromCoords(), XAP_Draw_Symbol::drawarea(), event_Insert(), m_CurrentSymbol, m_ix, m_iy, m_PreviousSymbol, m_windowMain, Scroll_Event(), UT_DEBUGMSG, and UT_return_val_if_fail. References XAP_Dialog_Insert_Symbol::_getCurrentSymbolMap(), _setScrolledWindow(), XAP_Draw_Symbol::calcSymbol(), XAP_Draw_Symbol::calculatePosition(), XAP_Draw_Symbol::draw(), XAP_Draw_Symbol::drawarea(), gchar, m_CurrentSymbol, m_fontcombo, m_ix, m_iy, m_PreviousSymbol, XAP_Draw_Symbol::setSelectedFont(), and UT_return_if_fail. References XAP_Dialog_Insert_Symbol::_getCurrentSymbolMap(), m_vadjust, XAP_Draw_Symbol::setRow(), and UT_return_if_fail. References XAP_Dialog_Insert_Symbol::ConstructWindowName(), m_windowMain, XAP_Dialog_Insert_Symbol::m_WindowName, and UT_ASSERT. References _constructWindow(), XAP_Dialog_Insert_Symbol::_createSymbolareaFromGC(), XAP_Dialog_Insert_Symbol::_createSymbolFromGC(), XAP_Dialog_Insert_Symbol::_getCurrentSymbolMap(), _setScrolledWindow(), abiSetupModelessDialog(), BUTTON_INSERT, XAP_Draw_Symbol::calcSymbol(), XAP_Draw_Symbol::calculatePosition(), DEFAULT_UNIX_SYMBOL_FONT, DELETEP, XAP_Draw_Symbol::drawarea(), XAP_App::getApp(), XAP_Draw_Symbol::getSelectedFont(), m_areaCurrentSym, m_CurrentSymbol, m_fontcombo, m_ix, m_iy, m_PreviousSymbol, m_SymbolMap, m_unixarea, m_unixGraphics, XAP_App::newGraphics(), s_Insert_Symbol_first, s_Prev_Font, XAP_Draw_Symbol::setSelectedFont(), UT_ASSERT, UT_DEBUGMSG, and UT_return_if_fail. References XAP_Dialog_Insert_Symbol::_getCurrentSymbolMap(), m_vadjust, and UT_return_if_fail. Referenced by Key_Pressed(), and s_scroll_event(). References XAP_Dialog_Insert_Symbol::_getCurrentSymbolMap(), m_SymbolMap, m_windowMain, XAP_Draw_Symbol::setFontString(), XAP_Draw_Symbol::setWindowSize(), and UT_return_if_fail. References XAP_Dialog_Insert_Symbol::_getCurrentSymbolMap(), XAP_Draw_Symbol::drawarea(), m_CurrentSymbol, m_PreviousSymbol, and UT_return_if_fail. 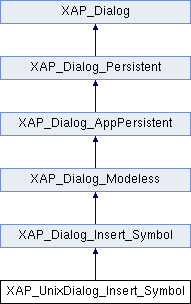 References XAP_Dialog_Insert_Symbol::_getCurrentSymbolMap(), XAP_Draw_Symbol::calcSymbol(), XAP_Draw_Symbol::calculatePosition(), XAP_Draw_Symbol::drawarea(), event_Insert(), m_CurrentSymbol, m_ix, m_iy, m_PreviousSymbol, and UT_return_if_fail. References XAP_Dialog_Insert_Symbol::_getCurrentSymbolMap(), XAP_Draw_Symbol::draw(), XAP_Draw_Symbol::drawarea(), m_CurrentSymbol, m_PreviousSymbol, UT_DEBUGMSG, and UT_return_if_fail. Referenced by _connectSignals(), _constructWindow(), runModeless(), and XAP_UnixDialog_Insert_Symbol(). Referenced by _connectSignals(), _constructWindow(), New_Font(), and runModeless(). Referenced by _createComboboxWithFonts(), destroy(), and event_WindowDelete(). Referenced by Key_Pressed(), New_Font(), runModeless(), SymbolMap_clicked(), and XAP_UnixDialog_Insert_Symbol(). Referenced by _connectSignals(), _constructWindow(), runModeless(), and setSymbolMap_size(). Referenced by runModeless(), XAP_UnixDialog_Insert_Symbol(), and ~XAP_UnixDialog_Insert_Symbol(). Referenced by _connectSignals(), _constructWindow(), _setScrolledWindow(), New_Row(), and Scroll_Event(). Referenced by _connectSignals(), _constructWindow(), activate(), destroy(), event_WindowDelete(), Key_Pressed(), notifyActiveFrame(), and setSymbolMap_size().